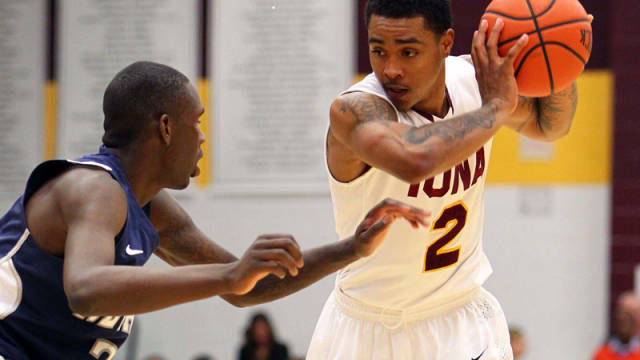 NEW ROCHELLE, NY – The Iona College men’s basketball team earned an 83-72 win over Niagara in its 2012-13 Metro Atlantic Athletic Conference opener at the Hynes Center. Junior Sean Armand’s first collegiate double-double – an 18-point, 11 rebound effort – led the Gaels (3-2, 1-0 MAAC) to victory over the Purple Eagles (2-4, 0-1 MAAC). Armand shot 6-of-12 from the field and 4-of-8 from behind the arc while adding a career-best 11 rebounds and dishing out five assists. He was backed up by five other performers with nine or more points. Senior Curtis Dennis had a breakout night for the Gaels with 17 points and matched his career-high with five three-pointers. Senior Lamont Jones, junior Tre Bowman and sophomore Tavon Sledge had 12 points apiece and senior Taaj Ridley added nine points in the win. Jones dished out five assists. Sledge also had five dimes and grabbed six boards. Bowman posted six rebounds and two assists. Niagara sharpshooter Marvin Jordan hit his second straight three-pointer at the 13:34 mark to give the visitors their largest and last lead of the contest at 14-11. Armand tied the score with a three-ball of his own on the next possession and started an 11-0 run to give the Gaels the lead for good. Dennis scored eight straight to open up a 22-14 lead less than two minutes after the Maroon & Gold faced the deficit. The run extended to 19-1 and as capped by a Jones layup at 7:50 to give his squad a 30-15 advantage with 7:52 to play in the first half. Iona’s largest lead was 16 after a Bowman floater with less than three minutes left. Iona held a comfortable 43-31 lead at the intermission. An Armand three-pointer at 13:04 made the score 56-41. The Purple Eagles did not quit and quickly scored 11 straight points to get within four after three Antoine Mason free throws at 11:39. Dennis ended the prosperity for the visitors with a three-point dagger on the Gaels’ next possession. An 8-1 run put the Gaels ahead again by double digits with 9:30 to play. The see saw action continued as Niagara scored nine of the game’s next 12 points and trailed 67-62 at 5:27. Naturally, it was Iona’s turn to run as seven straight points including five from the free throw line all but sealed the game with 2:26 to play. Mason led the Purple Eagles with 24 points on a 9-for-16 effort. Jordan added 14 points and three assists, sophomore Ameen Tanksley posted a double-double with 13 points and 11 boards. As well as the visitors held the Gaels’ leading scorer Jones to well under his season average, Niagara’s top playmaker Juan’ya Green posted 12 points and five assists in the loss. Iona shot 53.6% in the first half and 45.2% for the game. Niagara was held to 43.1% from the field including a 6-for-23 (26.1%) mark from beyond the arc. The two teams matched each other with 18 assists while the Purple Eagles held a slight 40-38 advantage on the boards. The Gaels complete its early season MAAC action next Wednesday (Dec. 5) when they travel to Jersey City to take on Saint Peter’s.